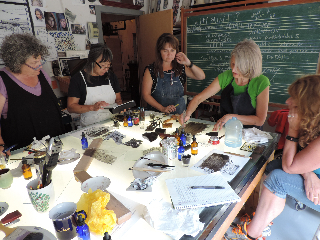 I’ll be teaching a 5-Day Stained Glass Painting Workshop Sept 14-18th at my studio in southern Vermont. We’re 3hrs drive from Boston, 4hrs from New York City and 10 mins from the border with western Massachusetts. One place is definitely still available. Participants will learn how to mix, thin, and apply kiln-fired lead-free paints with an inexpensive, non-toxic food additive, plus techniques that enable lively, expressive trace-lines, printed effects using lace, plastic and rubber tools, and how to create faux textures such as stone, wood, fur and fabric. We start with group exercises that explore innovative methods of application, and then move swiftly on to individual projects. Students who wish may work on self-portraits. My glasspainting techniques make it easy to achieve beautiful results, even for beginners. These intensive workshop are also really helpful for experienced glasspainters who want to develop greater ease and fluency. Class size is small (max. 6) with lots of individual attention. Tuition $860, includes lunch each day. More about hours, lodgings, fees and scholarships here. Watch videos of real-time glasspainting demonstrations, on vimeo, read blog posts about my workshops at Arrowmont School of Arts & Crafts, Williams College and Vermont or photos of past student work on my website. Scroll through the teaching folder via little grey arrows at bottom of screen. Happy glasspainting to all my stained glass friends, but especially, to past students. The stained glass easel; why?